On the Second Runway site, the eviction process has been a strange feeling of mutual tolerance and respect in relations between Randall Hibbert, the Under-Sherriff of Cheshire, and the Second Runway Protesters. Though the primary mission of the bailiffs is to clear the site, they are allowing food supplies to be taken in. According to the "gentlemens' rules", the welfare of the protesters is of paramount importance, and so there is no intention to starve them out. Nevertheless, the Under-Sherriff has been widely criticised for not allowing independent observers to oversee the eviction process. A group of evicted protesters occupied the Under-Sherriff's office in Chester to make the point. At the "Sir Cliff Richard OBE Vegan Revolution Camp", one person found an effective if gruesome way to hold up the eviction: She attached herself to a tunnel door with a noose round her neck. The noose was subsequently removed, but the woman still refused to come out. Another woman was removed on Thursday. She had been locked on to blocks of concrete in a tunnel, had been underground for 36 hours and was treated for mild hypothermia. She was charged with obstructing the Sherriff's men and released on bail. Yesterday local residents went on another walk to the site entrance, and among them was ex-Beirut hostage Terry Waite, who made an impassioned speech against the development. He criticised the way the eviction was going on without the presence of independent observers and called on the Government to suspend the whole development and review the environmental issues. It's too late to save the trees in the Bollin Valley, as they have already been cut down by the contractors. Nevertheless, some anti-Runway 2 activists are hoping something can be done to stop the development, even at this late stage. Some commentators rightly point to the fact that the new runway has been approved by law, which the protesters, they say, ought to obey. However opponents of the runway are of the opinion that the 101 day enquiry was weighted heavily in favour of the Airport, which had limitless funds to put its views across. By the end of the enquiry, many regarded the approval by the Secretary of State to be no more than a "rubber stamp" procedure. Even if they're bound to lose the battle to resist eviction, the protesters have succeeded in bringing the issue of environmentally damaging development to the top of the agenda, and the Labour government have already announced that new criteria will be drawn up for assessing future road and runway-building proposals. On Thursday, the radio station Key 103 held an on-air auction for the last Manchester United shirt to be worn by Eric Cantona, and there was a winning bid of £15,350. Later, the bid turned out to be a hoax. The station decided not to give the shirt to one of the genuine lower bidders, and will find another way to use the item. The money was to have gone to a charity. An RAF Squadron leader from Manchester was awarded Norway's Military Medal for Heroism after an incident last July in which he managed to land his fighter after it caught fire in flight. If he had simply ejected, the aircraft might have crashed on the town of Trondheim. Instead he landed it safely on the airstrip. Squadron Leader McDonald-Webb, aged thirty-six is from Stalybridge, and was serving as an exchange officer with the Royal Norwegian Air Force. The Queen has given him special permission to wear the medal on his British uniform. A four-word slogan dreamt up by "Marketing Manchester", the body set up to project Manchester's image in the world, has met with widespread disapproval. "We're up and going " is a catch-phrase intended to sum up the new spirit of enterprise, expressed in a typically down-to-earth Mancunian idiom - that's if I've understood the intentions of the marketing people correctly. There are posters and tv adverts, in which a typical Mancunian looks up from his workbench and informs the viewing public: "We're up and going". But many people think the slogan lacks vitality and panache, and doesn't reflect the energy of the city. The controversy has highlighted a problem with Manchester's identity, and the image of the city that marketing people want to project to the world. While Manchester's traditional image of "flat caps and cotton mills" may be genuine and homely, it's also backward-looking and out of tune with the 21st century. On the other hand, the glossy brochures produced by the Council trying to portray the city as an ultra-modern centre of commerce and enterprise, succeed in presenting a place hardly recognisable as Manchester. If only the city had a single, recognisable symbol, such as the mermaids of Warsaw or Copenhagen, or New York's Statue of Liberty. The Manchester Anti-Racism Festival took place in Heaton Park today, and the slogan for the day was: "All Different All Equal". 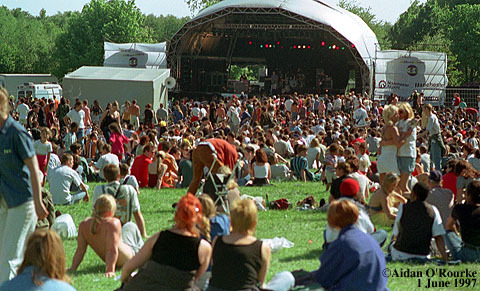 In bright sunshine, thousands came by car, bus or Metrolink, and gathered in the central part of the park to listen to the music. A large stage was set up under a concert bowl, and around the edge of the area were stalls selling an exotic variety of foods, ranging from Japanese noodles to Italian pizzas. Hot dogs were available, but there wasn't a meat pie to be seen! Much of the food was vegetarian, catering for the large number of young alternative types who form the mainstream of the city's radical trendy population. Yellow and green hair, pierced ears, noses, and other parts of the body, grungy clothes, accents and postures were everywhere to be seen among a crowd in which all shades of skin colour were represented, from deep, shiny Afro-Caribbean brown through to pale North Manchester white. A few flame-red shoulders and necks were noticeable, but on the whole people seemed to have heeded the warnings of weather forecasters and used suntan lotion. Toddlers and under-tens accompanied their parents, some of whom lounged in groups on the grass drinking pints of lager from plastic glasses, and a Jamaican-looking granny braved the heat in her Sunday best. Anthony Wilson introduced the artists, who included Kaleef, Audioweb, Talvin Singh and Anokha, Ice-T, Bodycount, Hothead, the Bhundu Boys, Lewis Taylor and a DJ set with Frankie Foncett and VJ Jools. A talented group of girls aged 14 and 16, called Cleopatra, sang vocal harmonies as soulful as any Stateside act. Looking at the crowd and listening to the music, this could be a festival in Brooklyn or Detroit - Black American music and culture are at home in Manchester and have been since the sixties, another shade in the wide spectrum of peoples and styles that go to make up the contemporary character of the city. It's been a hot, sun-scorched week in Manchester, which, like the rest of the country, is basking in clear weather, brought to us courtesy of a large area of high pressure sitting on and around the North Sea. The weather people predicted the sunny spell would be over by today, but they got it wrong, and so Mediterranean skies will continue for another couple of days at least. Temperatures have been exceeding 20 degrees celsius, or 70 degrees fahrenheit, though there was a cool refreshing wind blowing through the city today. Runway latest - nine protesters are holding out in a four story structure known as "Battlestar Galactica", which is 70 feet up a tree. Under the ground, Disco Dave and Wayne are in a tunnel called "Wormhole at the Vegan Revolution camp". Three others are in the "Cakehole" tunnels at the Flywood camp. HAVE A LOOK AT CHORLTON WEB A NEW WEBSITE FROM ONE OF MANCHESTER'S FRIENDLIEST AND TRENDIEST SUBURBS!